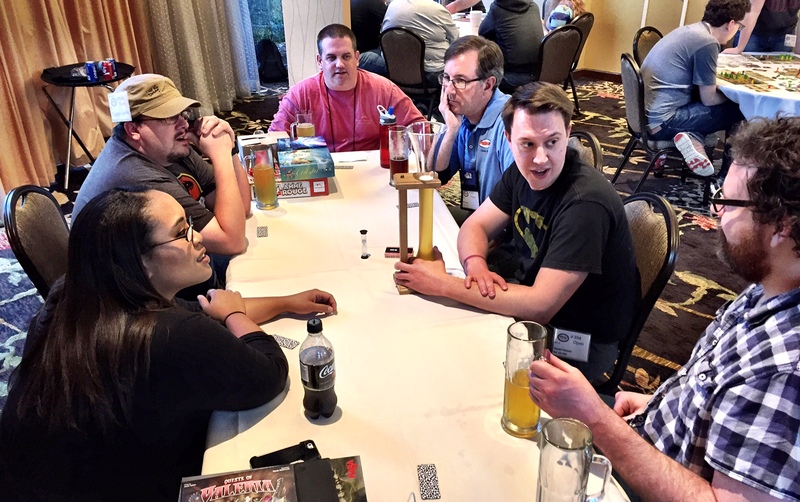 Many of us on podcast attend a ton of conventions during the year, but none are as relaxing or as enjoyable as PrezCon. There are no work duties, no meetings, no networking – nothing but kicking back, playing games, and spending some quality time with old friends. This year’s con was a bit sleepier than most, but all the usual suspects were still around to make sure it was just as memorable a tradition, as always. I’m grateful for you covering the situation with Eggs and Empires and Campy Creatures. I would not be able to release Campy under good conscience if I thought it was a copy of E&E or if we just plopped abilities out of that game and put it into ours. 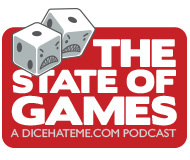 Where we started with the design of the game (Raj meets Brave Rats meets high-low scoring in Tschak), the decision we made from playtesters, and how we arrived at those abilities were vastly different than just looking at E&E and pulling from it. We believe the way the game plays and the decisions you’re making around those abilities are quite different than E&E, but that doesn’t change the fact that people mentioned it looked too close for comfort. To distance our game from E&E, we’ll be including The Demogorgon that will switch out with one of those abilities to provide a push-your-luck style card to the game. We don’t want to be lazy, but didn’t feel comfortable changing all those abilities because of how playtesting lead us toward them. My hope for this situation is we can be open, try to make right any “not coolness,” and let you guys / anyone on the fence come to an informed opinion about it all. I’m thankful to be a part of a community that isn’t afraid to shy away from issues like this. Thanks for taking the time to reply here! My apologies on not getting back to you for awhile; WordPress was eating comments and I just became aware of the problem so I could fix it. We do appreciate you wanting to address any criticisms of Campy Creatures, and I think we were open and fair in our comments on the podcast. It was great that you talked extensively with TC behind the scenes, so it definitely exhibited a willingness to clear things up. I’m sure we will discuss it again on the podcast once Campy Creatures is in wide release and we have more information from a larger sample of the community. Thanks again for the dialog, and best of luck with your next project!